This male cricket (prob. O. texensis - Texas Tree Cricket) was observed at Bumblebee, Yavapai County, Arizona. The host plant is Goodding's Willow (Salix gooddingii). 08 June 2008. Identification provided by Nancy Collins. This delicate-looking insect is a male tree cricket. He is in possesion of two very sophisticated instruments to help him secure a mate. The pair of long antennae packed with chemoreceptors will alert him to the slightest chemical change in the air that might indicate a female or food source nearby. Then there are the wings - the musical instrument he chirps with. A precise frequency, melody and pitch he must match if any female cricket at all will heed his song and follow. 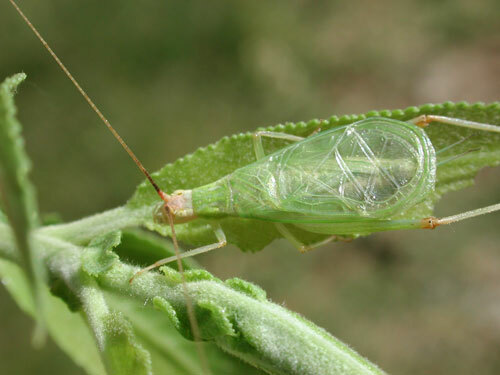 Tree crickets feed on fresh new leaves and flower buds which are generally only available twice each year in the Sonoran Desert, once in spring and then again after the summer monsoon rains. Some years one or both wet seasons are missed altogether resulting in mortality and very low populations of tree crickets. There are a number of Oecanthus species in the region of the Sonoran Desert. Distinguishing them is best achieved by analysis of the chirping male songs with sound instruments; the songs vary in specific ways between species.